Two weeks ago, one of my friends messaged me on Facebook letting me know about a fashion show in San Francisco that was happening May 6. It was the annual graduation fashion show for the Academy of Art University. I checked out their previous shows online and found them to be quite cool, so I was interested in attending. So my friend says that the Academy of Art was hosting a competition to win VIP tickets (front row seating, goodie bag, etc). All you had to do was tag them with your best OOTD on Instagram. There were only a couple days left to enter the competition and I only had two new looks on my Instagram to share. So I went ahead and tagged them on those looks just before the competition ended. And guess what? I won! If you're curious, the photos I entered were this and this. So this past weekend, me, the hubs and my friend attended the fashion show. You might have seen some highlights on my Instastory. But no, this is not what I wore to the show. I was actually hoping to wear something else but it didn't arrive on time. I was told that it would get to me by Friday, but sigh, that did not happen. Isn't that the worst! Today I'm sharing a look that I considered wearing before I opted for this jumpsuit instead. 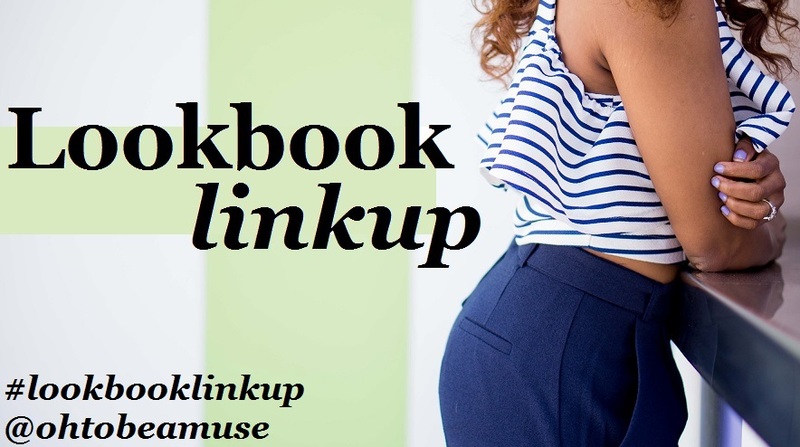 And I'll share what I was planning on wearing in a couple weeks on the blog. Two words: pajama set. I said it before and I'll say it again, culottes are my jam. I should stay away from them given my height, but I seriously can't help myself. And if you think these culottes look familiar, then you've been reading the Muse since at least 2015. The same goes for the crop top from that year. The belt is one that I've had for a ridiculously long time and it's a no-name, but it really pulled this entire look together, and you already know the story of the shoes. But hey, enough talk. you look so cute in culottes, I love them too. Perfect outfit! Congrats on winning the tickets --- and you make culottes look so effortless and chic (I'll admit to still experimenting with my one and only pair as I haven't totally nailed down how to wear them). Congrats on winning! You totally deserve it. Both tagged outfits were gorgeous! 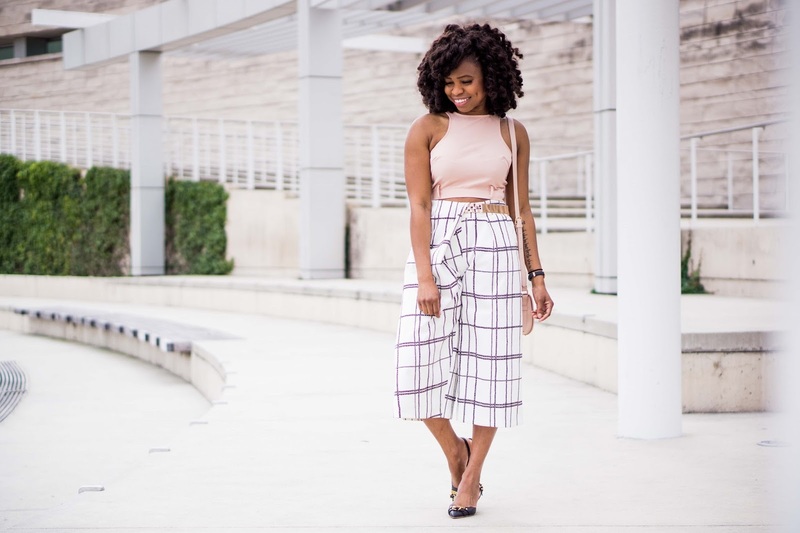 I am also obsessed with those culottes! They're so cute! 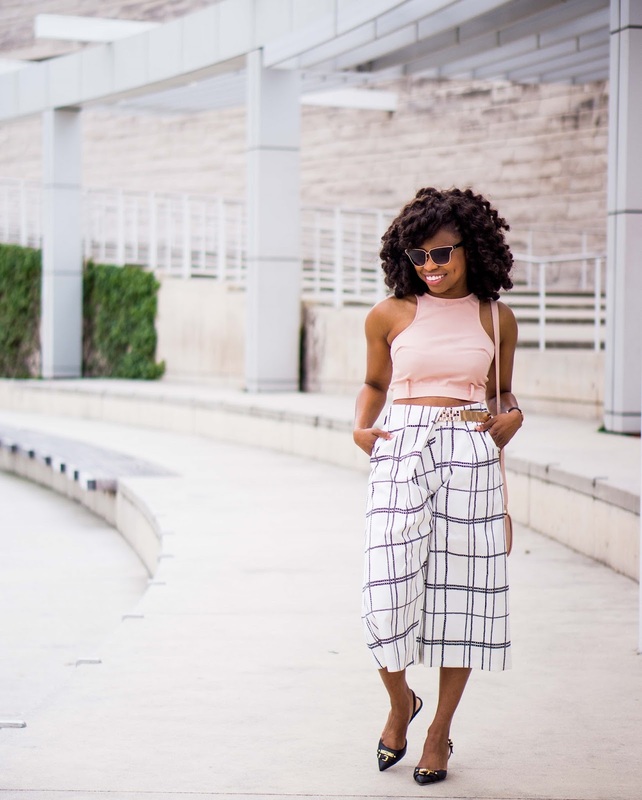 I love these culottes! Love the purple colour of the window pane design. Congrats on winning too. Must have been fun! I love that jumpsuit you chose too. Those sheer sleeves? WINNING! Congratulations on winning the VIP package! It's no wonder you like culottes so much since you are rocking these. How awesome is that! And those culottes are so cute! Yay ! on winning the tickets. I don't think i have ever won anything on Instagram. Great culottes, the waist details is superb. LOVING this outfit. Those culottes are everything. Oh, and congrats on winning! That's awesome! You won, how exciting! 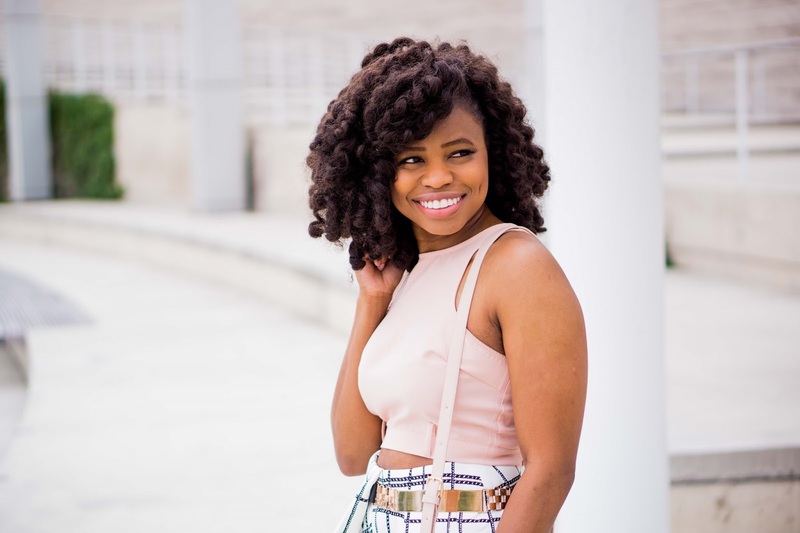 This blush top is just perfect with the culottes and that HAIR. . .
Those culottes rock, Cheryl! I'm vertically challenged too so have avoided them, but I actually saw a sewing pattern for it that I wanna make. And yay to winning the VIP tix! Great culotte look, Cheryl! These are definitely your style. You are rockin' this outfit!! seriously this combo, love it girl! You are rocking those culottes!